North by Studio PERCH in Montreal. During the year's grimmest month – February, when our shoes can handle the salt stains no more – Toronto's annual Winter Stations event, now in its third and most creatively ambitious year, is a revelation. 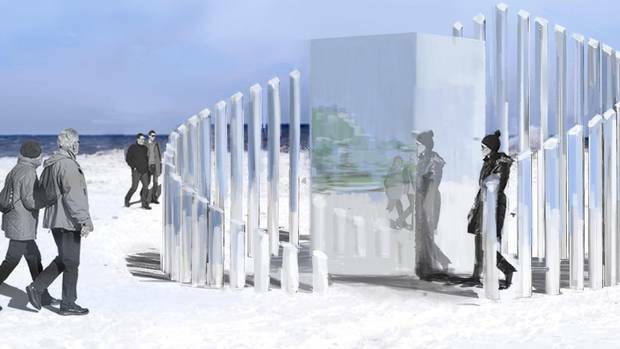 The public art event in the city's Beach neighbourhood involves eight teams of artist and designers from Canada and around the world erecting thoughtful, provocative and fantastical structures that draw people out of their hibernation. The theme of this year's iteration is Catalyst, and the most exciting installations challenge viewers to change their perceptions on an important issue and even instigate change themselves. One called Flotsam and Jetsam, designed by a team of architecture students from the University of Waterloo, looks like a beautiful, 20-foot high sculpture of a fish. On closer inspection, its torso, filled with plastics, is a commentary about how our reliance on disposable packaging is polluting the environment. Collective Memory by Mario García, Barcelona, and Andrea Govi, Milan. Another, Collective Memory, by a Spanish and Italian team, is composed of bottle-lined walls. Visitors are encouraged to take and leave messages about their experiences immigrating to Canada, using the bottles as the means of exchange. The concept was inspired by the statistic that by 2031 nearly half of Canadians over 15 will be foreign born or born to foreign parents, and through public interaction it should tell a compelling, complex and dynamic narrative about what it's like to land on new shores. 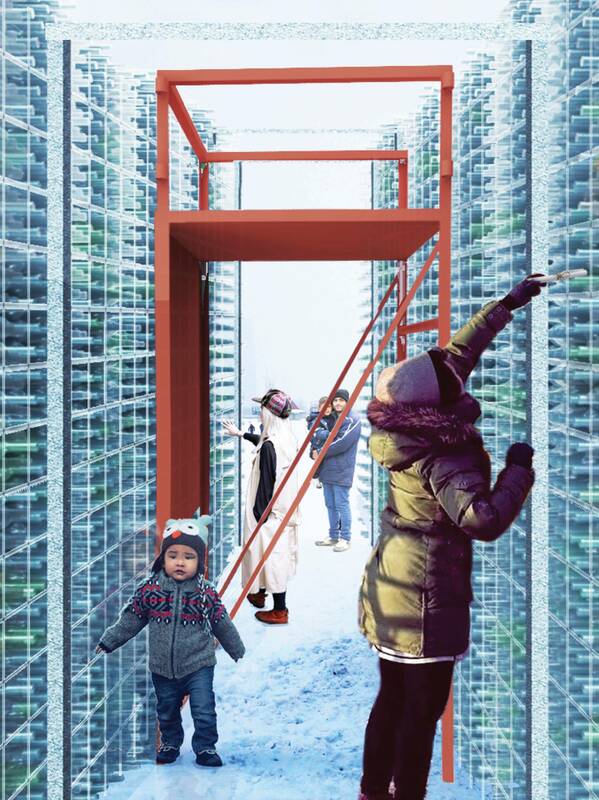 Inspired by Winnipeg's Warming Huts: An Art + Architecture Competition on Ice, an annual public art event that has been running since 2009, the Winter Stations competition started in 2015 and interest in it has grown steadily since. This year, the most submissions yet (over 350) came in for the eight pavilions. There are few formal requirements to enter a proposal. The entrant doesn't have to be a registered architect, professional artist or have a portfolio of projects ("We've had children submit ideas," says architect Aaron Hendershott, one of the event's organizers). The proposal simply has to incorporate one of the lifeguard stands that are spaced along the shore and be realistically buildable within a $10,000 budget (the funding comes from a variety of sponsors, including Hendershott's firm, RAW Design). To stand out, it also helps to take risks, as many of the best Winter Stations have in the past. "The proposals that excite me the most are maybe the most difficult to pull off," Hendershott says. "Some, on paper, I just don't know if they are going to pan out. But then they work in the most wonderful and awesome ways." Last year, for example, there was a public (clothing-mandatory) sauna and a wood-burning fire pit, both of which Hendershott believes became "community assets" for the winter. One of the most daringly successful entries this year came from Montreal's Studio PERCH. Called North, it challenges our perceptions of its namesake region. "Canadians generally understand the north as fixed, strong and eternal," says Suresh Perera, one of the designers. "We wanted to play with that idea." 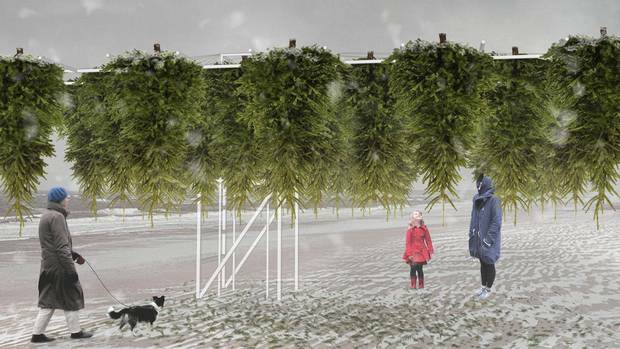 The piece is composed of 41 fir trees hung from a grid that is cantilevered out from the lifeguard stand like a wide-brimmed, vibrantly green hat. For Perera, it creates a "fragile, floating and suspended" forest that literally subverts our idea of Canada's landscape. It's surreal, to be sure. Perera calls it "Making strange, a place that is both familiar and odd." He hopes the unusual composition "creates a place for dialogue," where we can reflect on the natural world. The Illusory by a team from Humber College School of Media Studies & IT, School of Applied Technology. Another strong sculpture for 2017 is called The Illusory. Designed by a cross-disciplinary team of students from Humber College (including those studying visual and digital arts, interior design and industrial design), and led by Cole Swanson (professor and the Art Foundation program coordinator), it's composed of a mirrored box that is encircled by mirrored, spear-like pickets. "Conceptually, it's about the relationship between individuals and the environment," says Swanson. "Human bodies and the landscape both disappear and are revealed in the space. Everything becomes fragments and reflections." A jewel in the landscape, it will make us see the beauty of the beach in a whole new way. Winter Stations runs Feb. 20 to March 27. For more information, visit www.winterstations.com.